Your smile is important. It’s one of the first things people notice when they meet you. A brighter, whiter smile can help you feel better about yourself and leave a lasting impression. 32Strong provides the fastest and most effective teeth whitening system in a relaxed environment at the most affordable prices. Whether it’s coffee, tea, tobacco, red wine or just the effects of time that have stained your teeth, our professional teeth whitening system guarantees you a whiter smile in less time and at much less the cost of procedures used by dentists. 32Strong recognizes the importance of offering advanced teeth whitening with only the highest quality products and equipment. 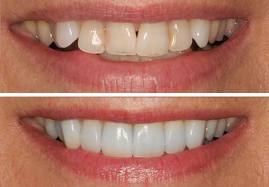 Our focus and determination is to provide superior teeth whitening results in a comfortable and private environment. We are committed to serving our clients with convenience and professionalism. • Stain of tea, coffee. • Yellowness of teeth due to age. • Bleaching is not very effective for florosis, smoking stains, tetracycline stains. • Bleaching not advisable for people with sensitive teeth. Periodontal disorder, or teeth with more cravel. The active ingredient (either carbamide or hydrogen peroxide) is broken down, allowing oxygen to enter the enamel and dentin, causing the protein stains to be lightened. The two most common active ingredients in teeth whitening are hydrogen peroxide and carbamide peroxide. While the two are very closely related, there are several differences. Hydrogen peroxide is “pure” hydrogen peroxide. In other words, it is not combined with any other chemicals. During use, it breaks down into water and oxygen while penetrating through the tooth enamel and breaking apart the longer carbon chain molecules that cause visible stains in the teeth. This oxidizing process is what causes the “whitening” effect. Carbamide peroxide is hydrogen peroxide dissolved in urea crystals. As a result of the combination of hydrogen peroxide and urea, it is less powerful, weight by weight, than “pure” hydrogen peroxide. Although carbamide peroxide still has hydrogen peroxide as the active ingredient, it has to undergo one more step before it can whiten. In order to provide the most rapid and effective whitening treatment, hydrogen peroxide is required. Hydrogen peroxide is what dentists use for chair-side whitening and it is what we use at 32Strong. This will depend on you and your oral habits. Teeth whitening usually lasts 1-3 years, however some people prefer to have touch-ups every 6-12 months. Yes. Research has shown that teeth bleaching with hydrogen peroxide or carbamide peroxide is safe for teeth and gums. 32Strong uses only approved whitening products. This will depend on your teeth and also how stained they are. Generally, the more stained your teeth are…the better the result. Will my teeth whiten evenly? There is an overall whitening of all teeth. Generally, the tip (biting edge) of the tooth will whiten quicker than the base (near gumline). Logically, thicker parts of the tooth take longer to whiten. Occasionally, during whitening treatments the teeth can result in a frosty, chalky appearance, This usually goes away by the end of treatment. For the majority of individuals there are none. However, some will experience temporary mild sensitivity on the teeth and/or gums. This will disappear after 48 hours of stopping the treatment. No. However, we recommend that you only drink water for at least an hour after the procedure. Will my crowns, implants, veneers and fillings get whiter? No, only natural teeth will whiten. Teeth that have restorations such as veneers or having been bonded with white fillings, cannot be whitened with hydrogen or carbamide peroxide. These materials do not whiten past the color they were originally made. The color of these types of restorations were determined by the surrounding teeth. If the surrounding teeth are whitened, the restorations will stand out and look artificial. Replacing old or discolored restorations will allow you to change their appearance. Procedure: Once we have determined that you are a candidate for teeth whitening, we compare your current teeth shade using the shade guide. Remember, when making comparisons, the number of shades whiter your teeth become is relevant to the number of shades on the guide. 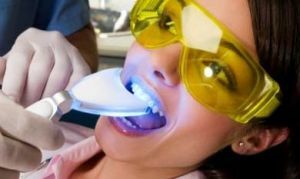 Once we agree on the current shade of your teeth, we can begin the whitening process, which involves careful application of the bleaching agent on to the tooth surfaces after a thorough cleaning and polishing of tooth surfaces. The whitening material is allowed to stay on the teeth surface for a recommended time period (upto 20 minutes) and exposed to a special wavelength light. This cycle is repeated to achieve the desired shade. We in 32Strong offer you two different tooth whitening treatments which we can adapt to suit your lifestyle and budget. Our ‘at-home’ tooth whitening treatment will give you whiter teeth in only two weeks and can be implemented entirely at your convenience. Alternatively, you can opt for Zoom Advanced Power the Wow! Factor professional tooth whitening system. Zoom Advanced Power is a scientifically advanced procedure that is carried out in less than one hour at our tooth whitening clinic. It is the brightest and most powerful chair side whitening. The ZOOM Chair side Whitening System is a safe, effective & very fast tooth whitening system. In less than one hours time the teeth will become dramatically whiter. The ZOOM ! Chair side Whitening is ideal for any body looking for immediate results. Hydrogen Peroxide, the active ingredient of ZOOM! has been safely used for many years in the treatment of gums & teeth. The whitening process is effective on most discolored teeth. Darker stains, such as those caused by antibiotics are more difficult to whiten. The degree of whiteness will vary from patient to patient, depending on the structure of the tooth. The procedure is simple. It begins with a short preparation to cover your lips and gums, leaving only your teeth exposed. Then, after doing the supragingival scaling and polishing, whitening gel containing hydrogen peroxide is placed over your teeth. The ZOOM advanced power lamp is used to act on your teeth to activate and break down the hydrogen peroxide. As the hydrogen peroxide breaks down, it allows oxygen to enter your teeth and bleach the dentin and enamel. This helps your teeth to have instant bright teeth in just 45 -60 minutes.